I want to mention first of all that I suddenly realised that I've been doing it all wrong! 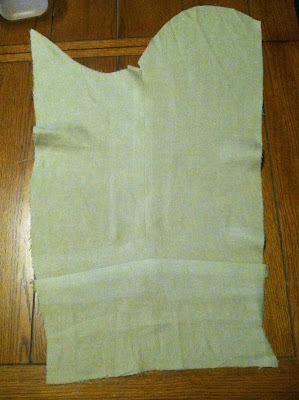 Well, not that bad, but when I got to the part of The Victorian Tailor that talked about the sleeves and collar, it mentioned something about now sewing the backs together. All this time I should have had the coat in two halves, unconnected. That certainly would have made sewing in the lining easier around the tails and inside. Ah well, I don't think it will be too bad. Anyway, I also noticed that I don't have any photos of the finished sleeve, but I'll save the "big reveal" for my next post. These sleeves will have a "false cuff." Basically this is instead of having a longer sleeve that turns up - instead it has an additional cuff added to the bottom. You'll see this style a lot on military coats, where the false cuff is a different colour, and has rank bars or decorative braid on it. In this case it will be plain, and I don't think I'm going to add buttons (not because I'm lazy, but because this is more of a casual frock coat - if such a thing exists - and I think a plain sleeve will be better). Next I added the false cuff. I think I should have used a pressing cloth when I pressed it, as the fabric discoloured a little bit, but when I've finished the coat I'll see if I can steam that back to normal. 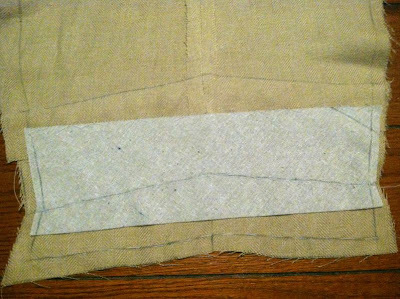 Anyway, you can see that there is no seam along the front side of the cuff, and it will just have one in the back. Then I added some bias interlining to keep the cuff in shape. 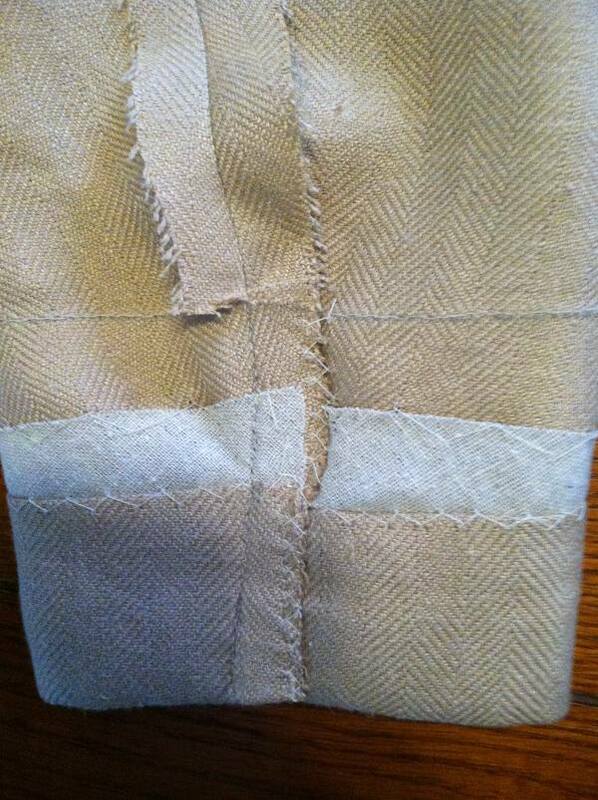 This is pad stitched along the side seams, and following the fold line chalked in. At the top it's cross stitched to the inlay of the sleeve. 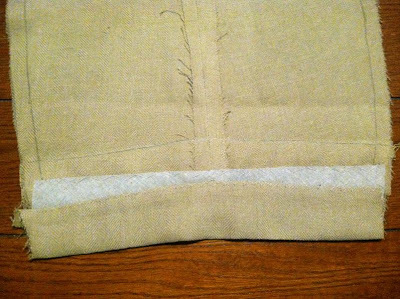 The cuff is hemmed up at the fold line (a healthy 2" in this case) and is cross stitched to the interlining. Here's what it looks like now from the right side. I seamed along the long sides, clipped it at the cuff line, and pressed it open. At the cuff I pressed it to the side so it will look as if it will open. This is not a functioning ("surgeon's") cuff, so don't need to worry about anything but cross stitching the seam in place. Here's what the opening looks like now. I've felled the seam allowance to the cuff on the top side so it looks like one piece. I sewed together the sleeve lining. This is the only part of the coat where I've used a sewing machine. With both the sleeve and lining inside out, I matched the sides together and basted the seam allowances together. 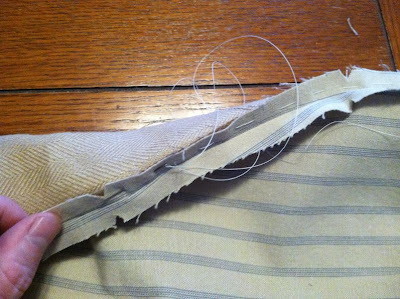 This will keep the lining from twisting inside the sleeve. Then the sleeve and lining are turned right side out. Just reach through, grab both ends together, and pull. 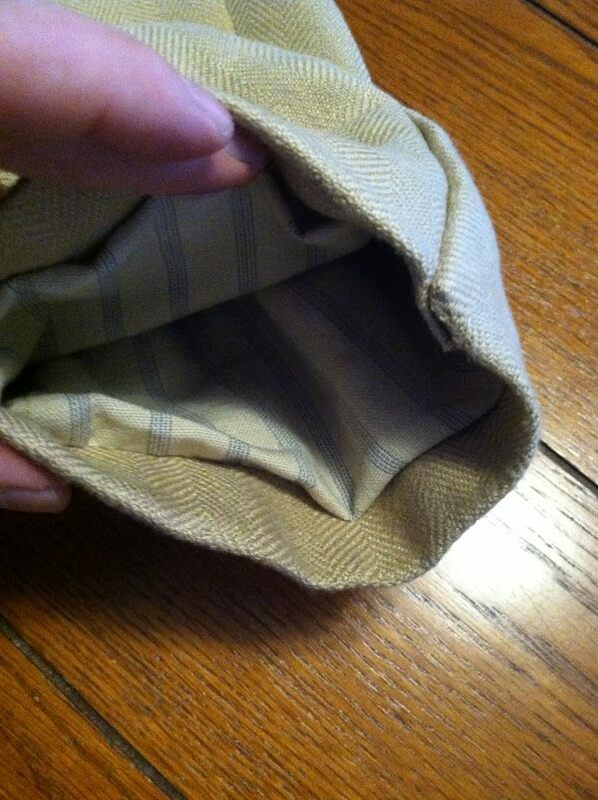 Note that the lining extends a little bit out of the cuff. It needs this extra length to sew properly. I hope this picture makes sense. 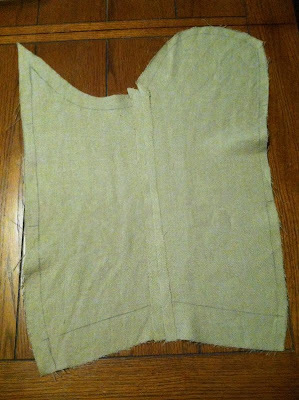 The sleeve is right side out, but I've turned the cuff inside out to sew the lining down. 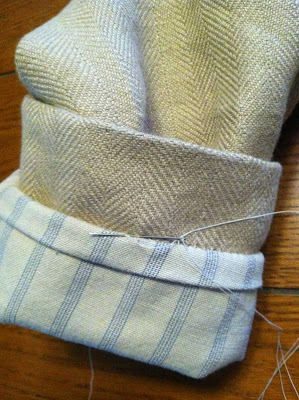 The lining is folded back under itself to about 1" from the end of the cuff, then basted in place. Then I turned down the lining along the basting line (this is why you need the extra fabric, because you're actually sewing fairly far back along the cuff), and felled in place. This will then fold back down, so the lining has a little bit of give at the end of the cuff. This is what I'm talking about. 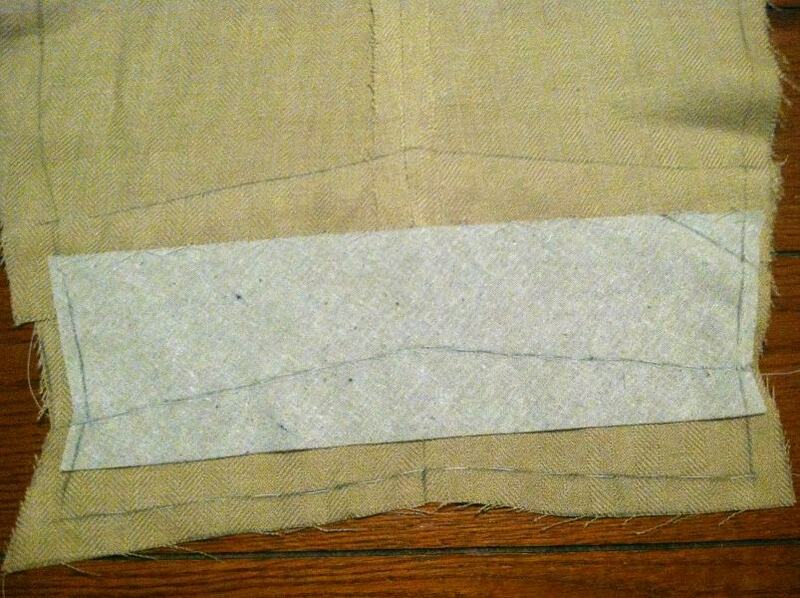 The lining folds back at the end of the cuff and is sewn down underneath. 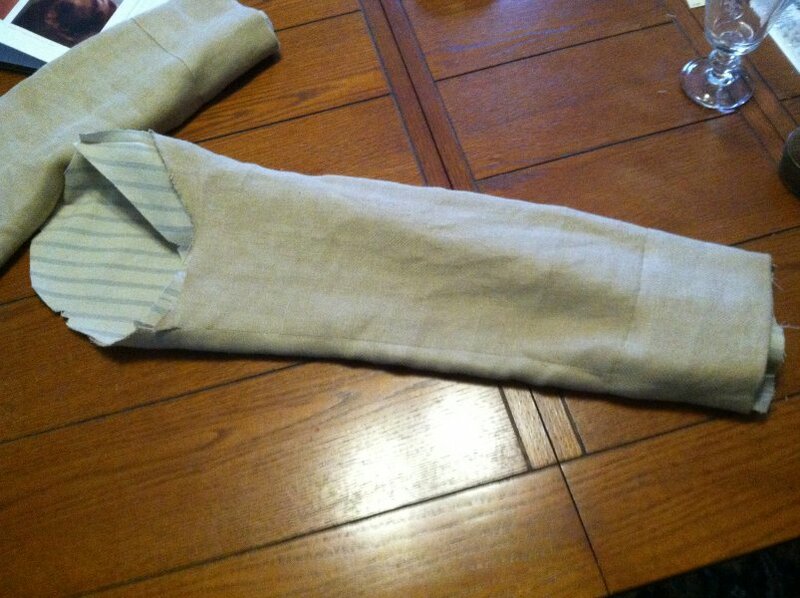 Now the sleeve is ready to be attached to the body. 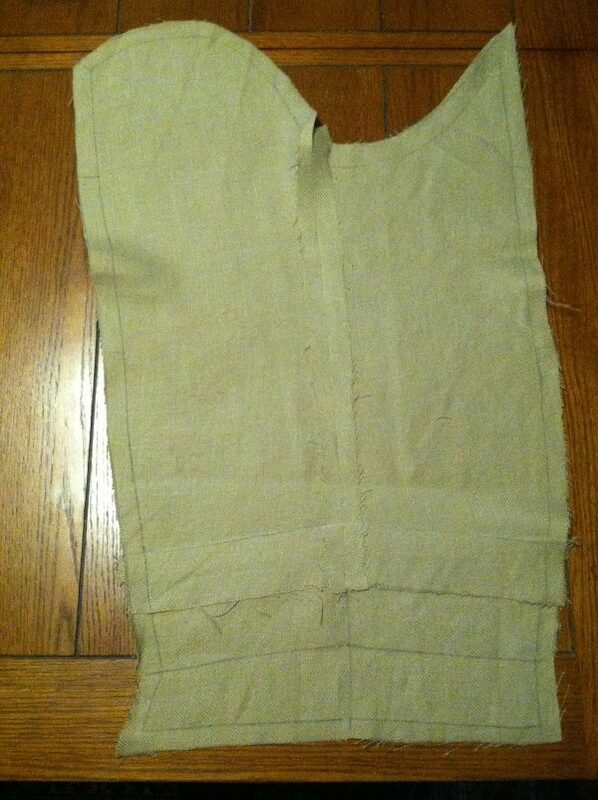 This is fiddly, and involves easing the sleeve head so it isn't too poofy, and doesn't have pleats. I didn't take any pictures, because I was futzing around with pins and basting thread, trying to get it right. 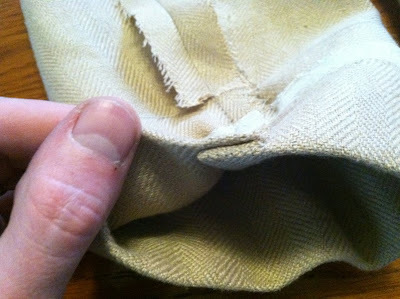 Here's a picture, after the sleeve is sewn into the armscye, of the sleeve head. It's sewn into the seam allowance, facing down the sleeve (which is inside out at the moment). 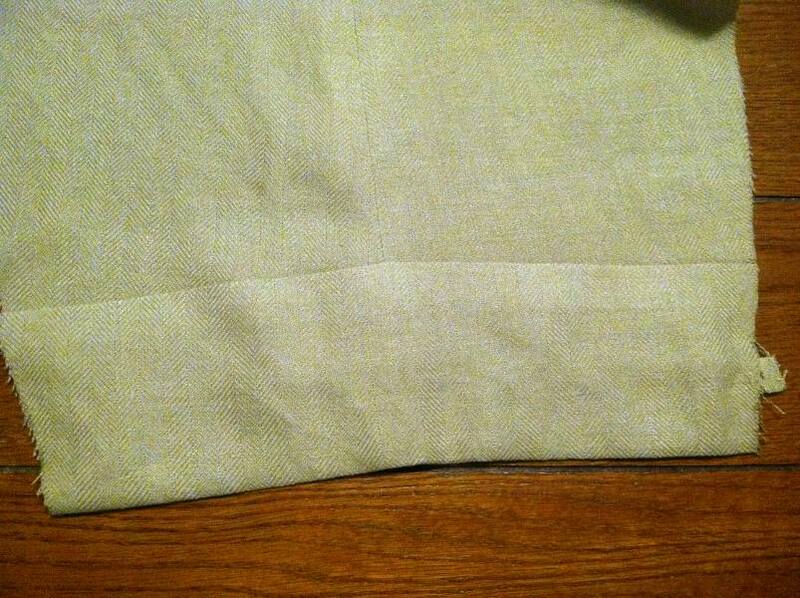 I made this sleeve head by folding a piece of handkerchief-weight linen around a sheet of linen pile. You know where I got the linen pile? From my dryer's lint trap after pre-washing a couple yards of white linen. I carefully peeled it off the trap, and kept it as a sheet. 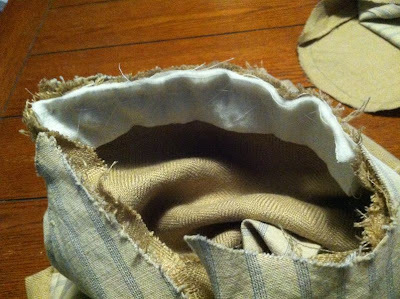 Now I have linen padding! The sleeve head will keep the roll of the sleeve smooth as it transitions from shoulder down to sleeve. That's all for now - I'm getting close to finishing! Thank you! I definitely want to make a modern jacket now - I feel like my Victorian tailoring has been an apprenticeship of sorts to being able to make the most complicated of garments. I'll be keeping my eye out on your jacket progress for tips, hints and inspiration. What a clever idea using dryer lint!!! I just washed 12 new flour sack towels and they produced a very thick mat of usable lint! Love the photos, especially of the inside of the lining and fold for ease! With all the hand work you have been doing, making a modern jacket will be a piece of cake.